This is the "Sibley" chart for the United States of America, made popular after the September 11 2001 airplane strike on the World Trade Center. 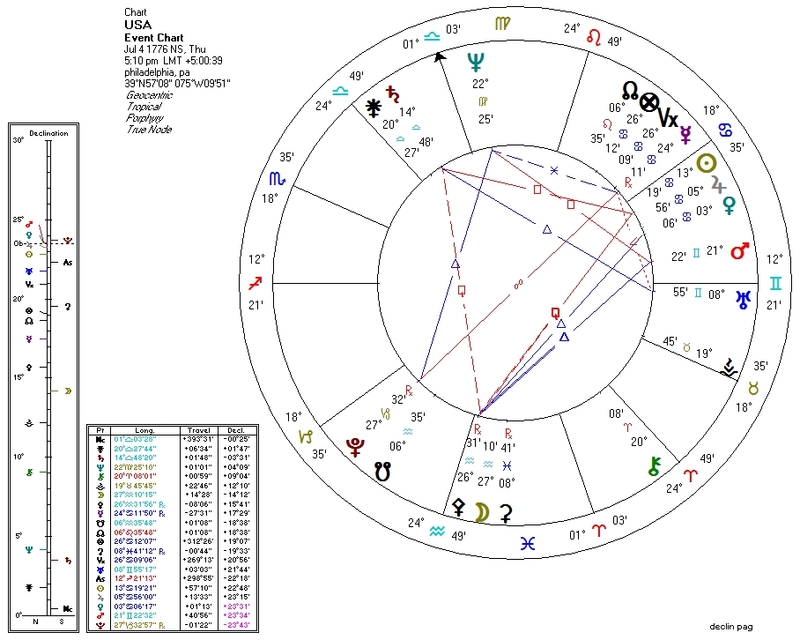 Plenty has been written about this chart and the other various charts astrologers use for America: the focus here will be on items of libertarian interest, using methods derived from my own extensive research. The sesquiquadrate yod with Sun and Saturn as the wings, centering on a Moon-Pallas conjunction, is striking. The Sun in Cancer in the Seventh House suggests a potentially conservative, home-centered national persona, but one in which international relations figure prominently. This Sun is square with Saturn in Libra in the Tenth House -- we might interpret that as a powerful authority structure, ostensibly formed around a Libran awareness of fairness, but one which might be fundamentally distrusted by the Cancer Sun. Both wings are sesquiquadrate a Moon-Pallas conjunction in Aquarius. We would, of course, suspect an emotional need for equality and some amount of freedom in society. Pallas with the Moon, however, tells us that this is the chart of a fighter. This conjunction, especially trine with Mars in the Seventh House, is very descriptive of the extremely powerful US military complex and its penchant for picking fights as much as it possibly can. This military complex is, as per the sesqui-yod, deeply ingrained in both the government authority structure and the national psyche itself. The movements of the military are largely obscured by deceptive reporting and outright omission by the national media. Neptune in the Ninth House square Mars describes this dynamic well. That the nation started out as a bastion of freedom and limited government is no surprise. Pallas is extremely prominent, being sesquiquadrate the Sun, quincunx Mercury, and conjunct the ruler of both. She is (aside from a semisextile with Pluto) out of the direct path of the three factors which cloud her judgment. The problem here is that her co-ruler Uranus is trine the South Node, and so is her other co-ruler Saturn if we use a wide orb. There is a tendency to lose her libertarian nature over time. This is, of course, exactly what has been happening over the history of the nation. Thanks to Pallas, this nation started as strongly free-enterprise capitalist. It was apparently never destined to remain that way. The South Node resides in the Second House of finances, and forms a quincunx aspect with Venus. America's destiny lies in the economic Left: indeed, she has not seen a fiscally conservative regime in over half a century. Even the American Right has completely adopted a fascist or light-socialist economic model. Conservatism on the cultural side is likewise also doomed. Not only is the Neptune widely quincunx the Moon, but also square Mars, the Fourth House ruler. The South Node is trine one or both the Moon's rulers depending on the orb we use. America has always been on the bleeding edge of cultural innovations, for good and ill. Cultural conservatives may occasionally win victories when certain planets line up (Richard Tarnas points out Saturn with Pluto), but the general trend is toward a Neptunian dissolution of cultural norms. Hinting at America's rich feminist history is Pluto tightly semisextile the Moon, which is also the ruler of Venus. America's increasing police state, economic decay, and rapidly mutating culture, are thus all in the Sibley chart -- arguably inevitable. Pluto is rapidly approaching an opposition with the American Sun, and not far off from the natal Pluto position. Actual or metaphorical death for America is coming. This astrologer is hoping for a peaceful breakup of the regime, and the return of freedom for those who want it. This land is big enough for all its inhabitants to peacefully form the sorts of societies -- plural -- that they want to live in.